Havelis belongs to more of domestic realms, unlike palaces, and forts that enjoy the monumental status. Numerous Havelis in Gujarat belongs to the citizenry rather than the rulers. In the bygone era, Havelis were built to cater the business needs of wealthy merchants. The ground floor of the Haveli is completely a private area, whereas the first floor has different entrance and luxurious interiors, and was meant for doing business and entertaining guest. Water harvesting is a regular feature seen in the mostly Havelis of Gujarat. In the Havelis of Gujarat, one can see the use of wood in abundance. Earlier, the use of wood in architecture was a matter of prestige but the scale and extent of carving within the given home were ultimately dependent on affordability. One can see the excessive use of wood in columns, brackets, frontage and courtyards. Notably, the woodwork in the Havelis of the Gujarat is coated with black preservative oil that gives it a dark appearance. The basic architecture of all the Havelis remains the same, some additions are done in some to make it look different. Gujarat is peppered with many Havelis made by wealth merchants. 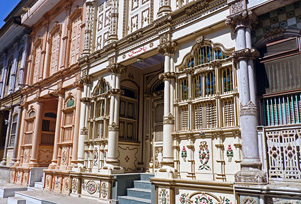 Tambekar Wada in Vadodara, Bohra Haveli in Siddhpur, Darbar Gopaldas Haveli in Kheda district and Swaminarayan Haveli Temple in Ahmedabad are an absolute treat for eyes. The town of Vaso in Kheda district, Gujarat are world famous for its Havelis. These havelis are a must visit for its intricate architecture.